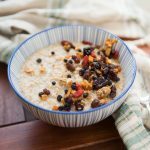 When you think about nutrients for healthy bones, the first thing that comes to mind may be, am I getting enough calcium? Well, you’re right- calcium is an important nutrient for healthy bones and teeth, but it’s definitely not the only one. Vitamin D and phosphorus are also key players in bone health. Our bones are constantly broken down and rebuilt through a process called “bone remodeling”. 99% of the calcium in our bodies is stored in our bones. 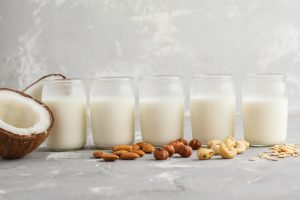 The other 1% of calcium is used in many other bodily processes including nerve function, maintaining acid-base balance in our blood, muscle contractions, blood clotting and blood pressure. The amount of calcium we need every day depends on our age and gender. 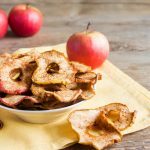 When we don’t get enough calcium in our diet, our body takes the calcium out of our bones in order to keep up with all of the vital bodily functions calcium is involved in. If that calcium isn’t replaced, it makes our bones weaker and more prone to fractures and osteoporosis. This is why calcium is such an important mineral to have readily in our diet. 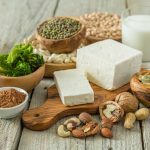 Where can we get calcium in a plant-based diet? Milk and other dairy products are the most well-known sources of calcium. However there is abundance of plant-based foods that contain calcium. For example fortified plant beverages like rice, soy or almond milk, which you can read more about here. Other foods also contain calcium, but just in smaller quantities. Supplements are another popular source of calcium. However, there are both advantages and disadvantages to getting your calcium this way. So now you’re eating a calcium-rich diet, which means you have strong bones, right? Well…not quite. Eating calcium provides our bodies with the building material for our bones, but it needs vitamin D in order to use it. Where can we get Vitamin D? Unfortunately, vitamin D deficiency is also fairly common since it’s not naturally found in many foods. When I say not many, it’s really just some fatty fish and UV-exposed mushrooms. The foods that do contain vitamin D are not good sources especially compared to the amount of vitamin D we get from the sun. Hence it’s nickname as the “sunshine vitamin”. So if you live in a Northern climate or don’t get a lot of sun, vitamin D supplementation and fortified foods such as orange juice, plant-based beverages, and grain products are worth looking into. Phosphorus is the mineral that works in balance with Vitamin D and calcium to create our bones. If our calcium intake is high, a high phosphorus intake will improve our bone density. But if our calcium intake is low, a high phosphorus intake will actually decrease our bone density. Where can we get phosphorus in a plant-based diet? 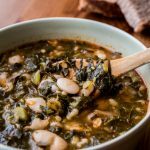 Plant-based foods that are good sources of phosphorus are protein foods such as beans, lentils and nuts, and whole grains. 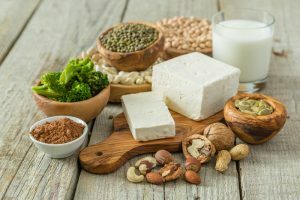 Achieving a bone healthy diet is possible when incorporating a variety of plant-based foods that provide minerals such as calcium and phosphorus. Luckily, many of the foods that are good sources of calcium are also good sources of phosphorus! But keep in mind that one of the key nutrients for our bones is not found in a lot of foods, and instead we need some sunshine (or supplements if you live in a Northern climate) to get enough vitamin D.
So the next time you are grocery shopping, make sure to load your cart with fortified plant-based beverages, dark leafy greens, and nuts and seeds. Your bones will thank you! And remember, you can always consult your local Registered Dietitian if you are still concerned that you are not meeting your requirements. What are your favorite plant-based foods that contain nutrients for healthy bones? Let us know in the comments below! Health Canada. Canadian Nutrient File 2015. Retrieved from www.hc-sc.gc.ca/fn-an/nutrition/fiche-nutri-data/index-eng.php.